Enjoy Life Foods asked if I wanted to participate in a little contest for bloggers using their new baking mixes. Of course, I said! The rules are that we have to create recipes using their new baking mixes (which they sent to us for free), post it to a special Pinterest board, and tag it with #tothefullest. Here are my entries for their Pancake and Waffle Mix, which is free of the top 8 allergens (milk, soy, egg, peanut, tree nut, wheat, fish, shellfish) and gluten. It also has added protein and probiotics making it a perfect allergy-friendly breakfast item! First, I started to follow the directions on the box of pancake mix to prepare the mix, but noticed it was only asking for me to use 2 cups of mix. I ended up using ALL of the mix in the box (not the 2 cups that it states on the directions) and I added 2 3/4 cups of water, and 3 Tablespoons of oil. My goal was to cook once and freeze it all for later. I cooked half of the batch of pancake mix, then added 2 Tablespoons of cocoa powder to the rest of the mix and cooked chocolate pancakes with the rest of the mix. YUM! I used 1 cup of powdered sugar and two strawberries and mixed it all with a hand blender to create the strawberry icing. Super easy. I stacked the pancakes, drizzled with strawberry icing, and chocolate icing and topped it with fresh diced strawberries. Viola! Strawberry Explosion Pancakes. 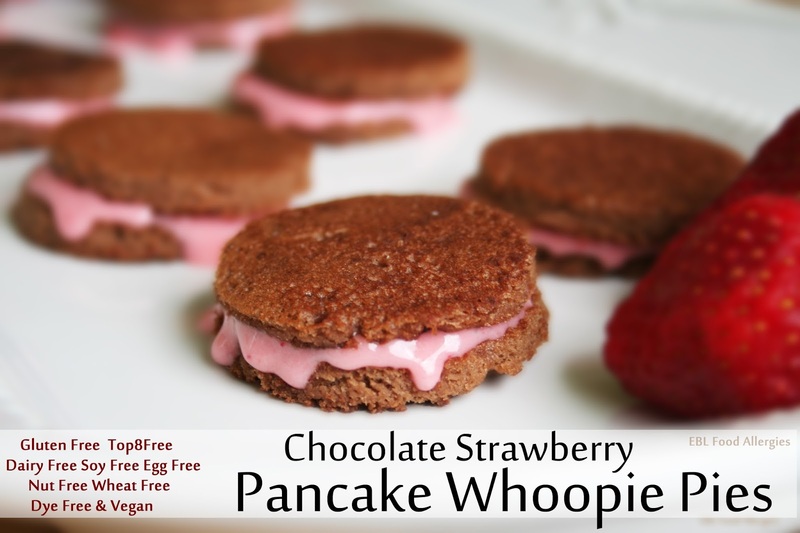 The second pancake recipe I decided to make were Breakfast Whoopie Pies, wait…WHAT??? Yes, you heard me right. Using the same strawberry icing as above, I cut the chocolate pancakes into little circles using a cookie cutter, piped the strawberry icing onto one pancake, and sandwiched it together with another pancake. My son LOVE LOVE LOVED these tiny, allergy-friendly breakfast whoopie pies and I’m sure you will too! I hope you enjoyed my two pancake recipes for Enjoy Life Foods #tothefullest contest. If you have time, head on over to their Enjoy Life #tothefullest Pinterest Board to see what all the other bloggers are creating. There are some GREAT ideas to make allergy-friendly cooking, fun! Want to try the pancake mix? Ask your local grocer to carry it or order it here! These look DELICIOUS. Love the cocoa powder idea AND my son would also love those little whoopie pies. Yum! Thank you! I've been making SunButter and jelly pancake sandwiches out of the leftover pancakes that I froze. Yum! I just have to say your recipes are photos are knocking my socks off! Especially your beautiful images. Good work. Keep it up lady!